This article is about the legal concept. For other uses, see Freedom of the Seas (disambiguation). Freedom of the seas (Latin: mare liberum, lit. "free sea") is a principle in the international law and law of the sea. It stresses freedom to navigate the oceans. It also disapproves of war fought in water. The freedom is to be breached only in a necessary international agreement. The United States' allies Britain and France were opposed to this point, as France was also a considerable naval power at the time. 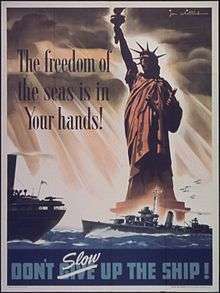 As with Wilson's other points, freedom of the seas was rejected by the German government. Today, the concept of "freedom of the seas" can be found in the United Nations Convention on the Law of the Sea under Article 87(1) which states: "the high seas are open to all states, whether coastal or land-locked." Article 87(1) (a) to (f) gives a non-exhaustive list of freedoms including navigation, overflight, the laying of submarine cables, building artificial islands, fishing and scientific research. In 1609, Dutch jurist and philosopher Hugo Grotius wrote what is considered the foundation of the international legal doctrine regarding the seas and oceans – Mare Liberum, a Latin title that translates to "freedom of the seas". While it is generally assumed that Grotius first propounded the principle of freedom of the seas, countries in the Indian Ocean and other Asian seas accepted the right of unobstructed navigation long before Grotius wrote his De Jure Praedae (On the Law of Spoils) in the year of 1604. Previously, in the 16th century, Spanish theologian Francisco de Vitoria postulated the idea of freedom of the seas in a more rudimentary fashion under the principles of jus gentium. During WWII, nations started to expand and claim many resources and water territories all over their surrounding coasts. There were four international treaties meticulously drafted in the late 1950s and onto the 70s, but the issues were not resolved between nations until 1982 when the United Nations Convention on the Law of the Sea was introduced. UNCLOS is a Law of the Sea treaty: an agreement of rights and responsibilities of nations and their use of the world’s ocean with guidelines of trade, environment, and the management of marine and open seas resources. UNCLOS replaced the four international treaties drafted in the late 50’s through 70's. As of 2013, 165 countries and the European Union have joined the Convention. According to International law, Article 92 of the convention which describes ships shall sail under the flag of one state only and, save in exceptional cases expressly provided for in international treaties or in this Convention, shall be subject to its exclusive jurisdiction on the high seas; however, when a ship is involved in certain criminal acts, such as piracy, any nation can exercise jurisdiction under the doctrine of universal jurisdiction. High seas were defined as any part of the sea that was not either territorial sea or internal waters, territorial waters and exclusive economic zones. Article 88 of the 1982 Convention states that the high seas shall be reserved for peaceful purpose. Many countries engage in military maneuvers and the testing of conventional weapons and nuclear weapons on the high seas. In order to deliver the right punishment to the right person or state, the ships need to be registered to a country to show proof of ownership. The owner of the vessel sometimes prefers to pay the lower registration fees by picking countries such as Panama, Bermuda, Italy, Malta and the Netherlands. According to Cruise Lines International Association, 90% of commercial vessels calling on U.S. ports fly foreign flags. To avoid the high cost with more rules and regulations, ships and tankers sometime prefer lower cost registration with a lower standard of inspection and regulation by picking a country that exercises less control over their registered ships, though many ships are owned by individuals or companies in another country (most commonly Japan and Greece) under a system called 'flag of convenience'. Registering a ship in Panama means that the ship is governed by the maritime rules of Panama rather than the ship owner's country. Ship owners do this because Panama has low taxes and fewer labor and safety regulations than most other countries. Ship owners can make their staff work longer hours in less safe environments, and therefore maximize their profits. Other countries, including Liberia, Cyprus and the Bahamas also offer flags of convenience, but Panama has the most ships registered under the scheme. Ships registered with the US will cost more, and the employee wages will be even higher. Freedom of the seas allows a ship to move freely on the ocean as long as it follows the international law. From the Vikings to the European, Central Asia, Africa and North and South America, trade has served an important role in history, and has been a key factor of a growing economy. Trade transfers the ownership of goods from one person or entity to another by getting a product or service in exchange from the buyer. When a ship sets sail, there may be many ports waiting for it to bring goods from all over the world for trade and sale. Free trade opening up markets to foreign suppliers increases competition. Without free trade, domestic companies may have enjoyed monopolies or oligopolies that enabled them to keep prices well above marginal costs. Trade liberalization will undermine that market power. The ocean is a big part of the free trade happening around the world. Every day we see silk imported from China, fruits from Mexico, spices from India, chocolate from Africa and many more goods in our home were imported from another country. The ocean made it possible for many countries to put their cargoes on to ships and transfer them across the ocean. Hundreds of nations joined the World Trade Organization. With goods to be traded from one nation to another through the transportation on various size vessels from coast to coast, trade promoted more economic value to goods where goods and services are produced to support the supply and demand of the participants in the organization. The Merchant Marine Act of 1920 is also known as the Jones Act. It is a maritime law that refers to federal statute 46 USC section 883, the act that controls coastwise trade within the United States and determines which ships may lawfully engage in that trade and the rules under which they must operate. The act is in place to protect jobs for America and its people working at U.S. ports, and on U.S. vessels. Many vessels around the globe sail under many different flags, and have different crews from different part of the world where the pay rate is much lower than the U.S. The Jones Act protects the Americans' jobs and restricts coastwise transportation of passengers and 46 USC section 12108 restricts the use of foreign vessel to commercially catch or transport fish in U.S. waters. Passenger Vessel Services Act of 1886, a similar law concerning passenger transportation between US ports. ↑ "A Guide to Ship Registration" (PDF). Maritime New Zealand. 2010-09-30. Retrieved 2012-12-12. 1 2 "Why are cruise ships registered in foreign countries?". Special for USA TODAY. 2013-01-08. Retrieved 2012-12-12. ↑ "A short tour of economic theory". A survey of world trade. Retrieved 2014-04-22. ↑ "The WTO in Brief". WTO. Retrieved 2014-04-22. ↑ "THE JONES ACT". Mike Vaughn, Attorney at Law. Retrieved 2014-04-22.